Today we are going to talk reptiles! The same principles of positive reinforcement training can be applied to reptiles. 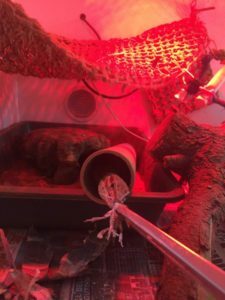 You may think – training a reptile?! Why would I do that! However you can actually make the veterinary and at home care of your reptile easier for yourself if you institute regular training. Things like training your reptile to accept food from tongs (particularly lizards and turtles) can come in handy if they ever need oral medication! Often the medication can be placed onto/into the piece of food and then fed to your reptile so they don’t even know they’re being medicated! Also regularly handling your pet reptile will mean that veterinary exams aren’t as stressful to your pet, as they are more used to hands. Did you know that you can feed lizards and turtles (and snakes) from tongs? This means that we ensure that our pet actually gets the amount that we want, and has the added bonus of being a way to hide medication if we need to give it! Many of the medications we use for lizards and turtles are given directly into the mouth (some are injections, and most snake medications are injections). This means that when they get sick you are often sent home with a bottle of medicine and syringes to use to put them directly into your pets mouth. Most lizards and turtles aren’t super keen to accept the oral medicine (and sometimes they don’t taste the best!) which can make your life difficult if you need to give it. To make it easier on yourself, some oral medications can be put on/into a prey item that is then fed directly into the mouth. This ensures that they get the dose of medication without you having to put the syringe in their mouth! If your pet doesn’t like feeding from tongs you can try giving them a treat (such as a gel food/fruit or vegetable baby food) from a syringe regularly so that they get used to yummy things coming from syringes. When they need a medicine we can just mix this in with their treat and they (hopefully) will continue to accept it. If you do want to tong train your lizard or turtle the best way to do it is to offer (via tongs) their favourite food item. For most lizards this will be a yummy insect (e.g. a cricket), and the movement of the insect often triggers a feed response. For turtles it may be their frozen blocks of food, or a piece of marinara mix. If we start to do this regularly your pet will eventually associated the tongs with food! And usually then readily accept other food items offered via tongs. As stated above regular handling is another important aspect of reptile training. Getting your pet used to hands can mean that trips to the vet are less stressful. When your pet comes into the vets we will do a full physical exam, which means we have a good feel of everything to see if we can pick up on anything that is abnormal. If your pet is used to regularly being held these exams are often quite stressless! It is always important to ensure you are safely handling your reptile – this means for lizards always ensuring their legs are supported and that they aren’t at risk of falling. For turtles they often feel quite vulnerable when picked up, so ensure you have a good grip to reduce the chances of falls. Snakes need to have their bodies supported to feel secure when they are handled, but snakes are much less likely to fall than other reptiles (they have a pretty good grip and are great climbers!). If you have questions about training your reptile, feel free to book an appointment with one of our veterinarians today.